A 2016 DOJ criminal investigation was suppressed and buried by the DOJ/FBI that involved a major NY Democratic power broker and the Clintons and the Clinton Foundation. 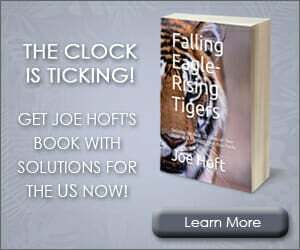 The investigation revolved around the illegal sale of controlled US homeland security technology to Russia and China in the years before the 2016 election. The DOJ terminated its internal investigation in 2016 despite clear and irrefutable evidence of criminal activity and hid it from the public! This story begins with the Clintons and their Clinton Foundation. 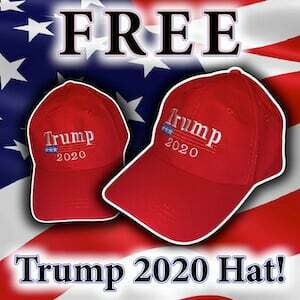 It includes Russia and China, and ends with another FBI/DOJ cover-up of Clinton crimes. In Part I of our series we discussed the Clinton Foundation and the donations to the Foundation from the COB and CEO of AGT International as well as from Sheikhs in the UAE. These donations in the millions of dollars were for favors from the Clintons. In Part II of our series we discussed the illegal actions that AGT International took to generate revenues around the globe. Highly sensitive ITAR classified technology was provided to China, Russia and other countries in the name of sales growth. These actions were beyond criminal, they were treasonous. 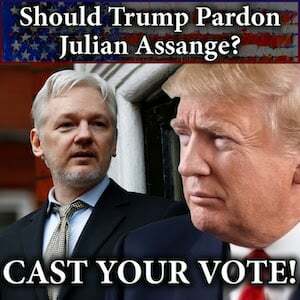 In Part III today we discuss the investigation that the FBI/DOJ started into AGT and the Clinton Foundation but then terminated and covered up before the 2016 Presidential election despite irrefutable crimes! It’s unknown who the letter is from but it is sent to the US Attorney’s Office regarding the court action noted above. The letter addressed a discussion that took place between the senders of the letter and the parties to which it is addressed (i.e. the US Attorney’s Office). The letter addressed potential tax evasion by AGT in the first couple of paragraphs. The letter followed up a discussions that took place on March 31, 2016, between the parties regarding the tax liability for “AGT International and all the companies within its shadowy domain“. The letter goes on to note that AGT has more than 2,000 employees and revenues of over $1 Billion annually, as boasted by the company’s CEO, Mati Kochavi. 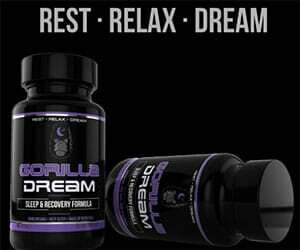 But despite these claims the US portion of the company shows little or no profit. AGT’s top management and world-wide back office were all housed in New York offices. This alone would cause major US tax obligations. This comment is damning because it asserts that AGT used one software and just renamed it wherever it went. If this software is highly technical and protected under US law from being exported to regimes that are restricted by US law, then AGT has a very big problem! 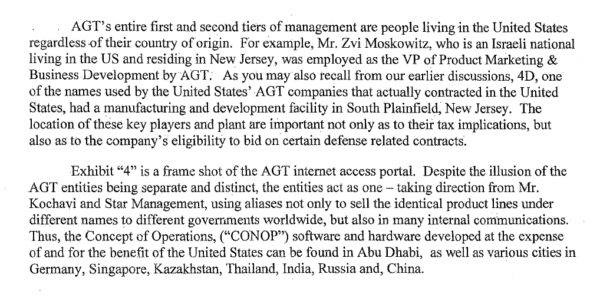 After describing more examples of AGT top personnel being housed in the US, the sender of the letter again notes that 4D, one of the names of one of the companies used by AGT, actually formed contracts in the US and has key players and a plant within the US which helps for eligibility for bidding on certain defense contracts. 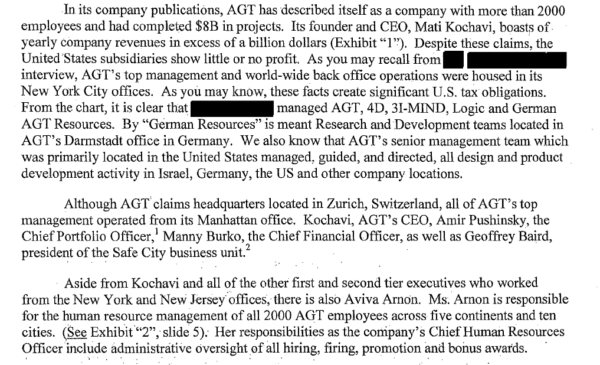 The letter goes on to state that AGT uses the same people with aliases around the world. It is unknown why they do this. Also, AGT had a project in Luoyang District in China with the name “Urban Shield’ which in truth was really virtually the same project sold to Philadelphia and other federal and state customers by AGT entities 4D and 3I-MIND as the Wisdom Command and Control software. The same marketing tools were also employed in China and used in the US. 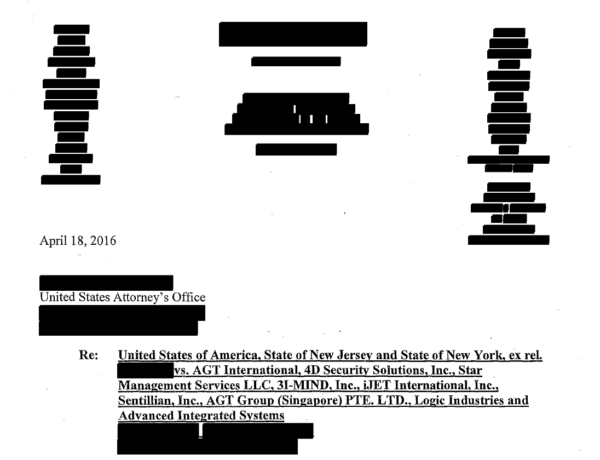 In summary, the letter to the US Attorney’s Office provides startling information regarding AGT. The company was under investigation in 2016. 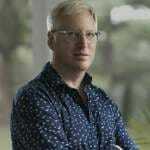 All evidence suggested that it owed millions to the US government in taxes. But most damning for AGT is the fact that it was selling software, developed and used in the US, and sharing this software around the world. This software was used for intelligence gathering and yet was shared with Russians and Chinese! This is against the law. At around the same time as the investigation, actions were allegedly taken by AGT. It was as if the company was tipped off. Many of its operations in and around New York were reportedly quickly shut down. What happened to this investigation and court action? Why were US voters not told about this investigation and the government’s actions? Were there more actions like this? Was this covered up due to AGT’s relationship with the Clintons? Is this the only investigation by the FBI related to the Clinton Foundation? Is this the investigation leaked to the press by fired former FBI Director Andrew McCabe? This investigation involves the Clintons and their pay to play machine, the Clinton Foundation. It was material to the 2016 US election and yet the FBI and DOJ suppressed it from the American public. It was terminated as can be easily surmised due to the fact that this investigation was never publicly reported and its timing was in 2016. 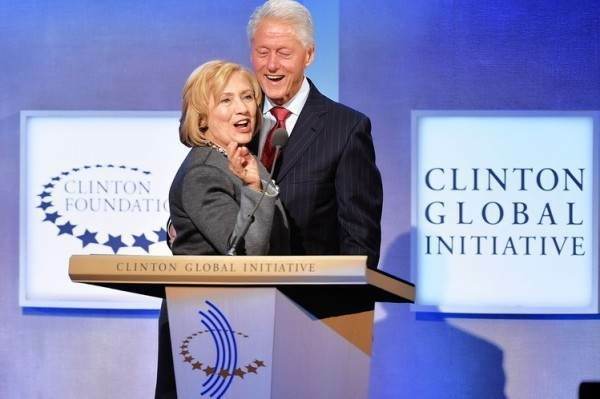 More crimes with the Clintons and the Clinton Foundation – More cover ups from Obama’s corrupt and conflicted DOJ and FBI. Will this finally be enough to institute an investigation into the FBI and DOJ and the Clinton Foundation? If America is to remain a republic Americans need honest answers now!